Blink and you may think you’ve driven into a quaint river town in Bavaria. 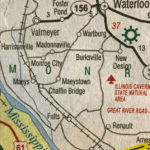 Such is the charm of Maeystown, a picturesque little village in Monroe County in Southwestern Illinois. Book a room at the Corner George Inn (once a hotel and saloon) and enjoy a day or two here. Visitors cross over an arched stone bridge to enter Maeystown, which is listed on the National Register of Historic Places. Three streams and a large spring flow through the historic town that was founded in 1852, and built into a limestone bluff. Narrow winding streets and well-kept period buildings add to the charm and make lingering here an absolute delight. Keep your camera or smart phone handy, there are photo ops everywhere in this charming village! One of the best ways to explore Maeystown is on a guided tour, which is available for groups of 15 or more. Lasting about 2½ hours, the tour –which can be walking or bus tour—includes an orientation to the history of Maeystown, visits to several historic buildings, a Wicks organ demonstration, and time to shop or stop for a quick bite. Plan a visit the first Sunday in December and you can enjoy “An Old Fashioned Christmas.” The festive event includes strolling musicians, carriage rides, lighting of the holiday tree, caroling, food and refreshments. German carol sing, 3:00 p.m.
Maeystown has several other notable festivals throughout the year, including a Fastnacht on the Tuesday before Ash Wednesday, a Spring fest, and Oktoberfest. Corner George Inn provides the ideal downtown location for exploring. Consisting of four buildings, including the original inn mentioned above, the inn offers six guest rooms with private baths, a sitting room on the first and second floors, a mezzanine, and ballroom where breakfast is served. Corner George Inn is a member of the Illinois Bed and Breakfast Association and offer a unique lodging experience! 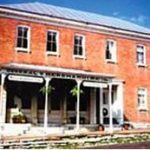 This entry was posted in History, Illinois Bed and Breakfasts, Illinois town of interest and tagged History, Illinois Bed & Breakfasts, Illinois towns by admin. Bookmark the permalink.